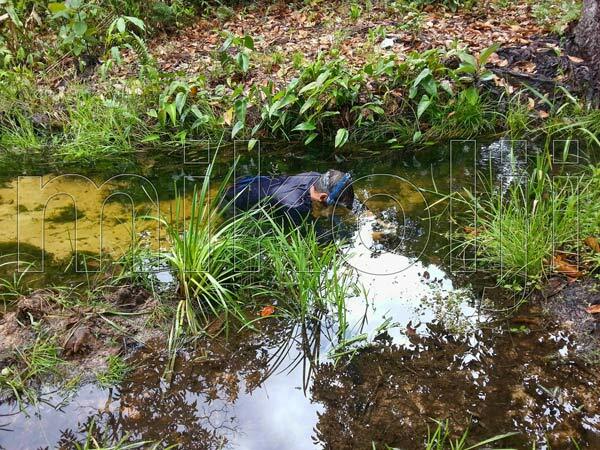 Ivan Mikolji photographing underwater in a clear water stream habitat, Venezuela. 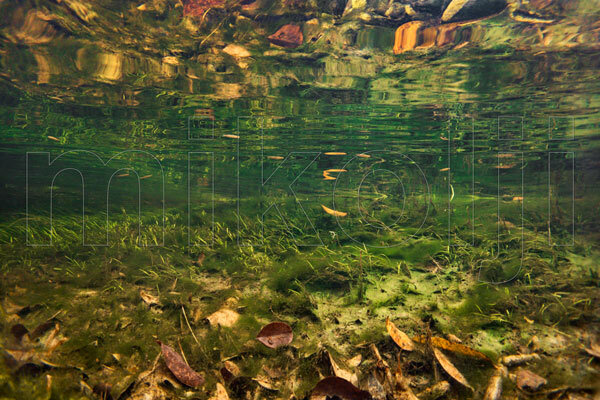 This is a landscape photograph of a rainforest clear water stream habitat, Amazonas, Venezuela. As time passes, I notice the noise is gone; it stopped raining. All of a sudden some big shadows appear in front of me, blocking the small amount of beautifully filtered light from the overcast day. I am taken out of my trance and pick my head out of the water. I see some small feet in front of me outside on the riverbank. They are village kids that have come to see what I am doing. I try to get back into “the flow” but they are blocking my light. I take my mask off and head out of the water. The three kids follow, right behind me. I sit on a log and there they are standing in front of me, staring. I ask them to tell me their names. Each of them answer smiling. I say, “I am taking pictures underwater of some very special fish. They are very small but super special. Would you like me to show you the pictures?” They nod their heads. I take my camera out of the underwater housing and show them the pictures on the small camera LCD screen. I ask “Aren’t they spectacular?” They nod their heads. “Did you know these little fish live in the stream?” They shake their heads from side to side, instead of saying no. “You know that what makes them so special is that they take care of their babies. They have many, many little fish babies and like your parents, they take care of them, look after each and every one of them.” They smile and BOOM, right there, the village stream has just changed from “the stream” to “their special stream” that has special fish in them, which we know as Apistogramma hongsloi. 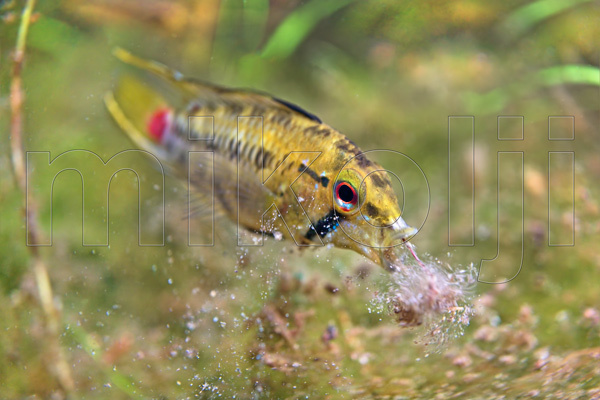 Dwarf Cichlid, Apistogramma hongsloi, feeding in its natural habitat, Amazonas, Venezuela. Apistogramma hongsloi can be found in many streams of the Orinoco River basin, especially the ones between the Sipapo and Caura River. I have swam with them in many locations and spent hours underwater observing, videoing, and photographing them throughout the rainy and dry seasons. 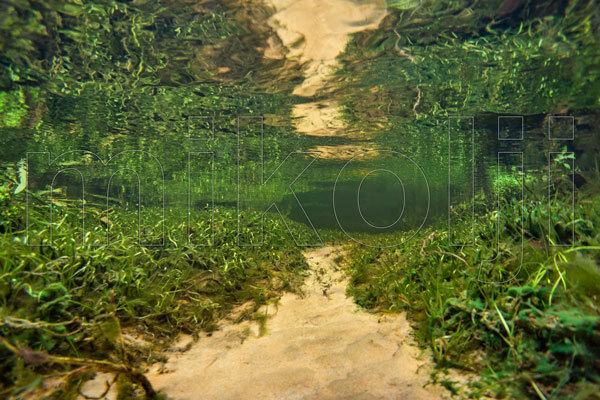 This is a freshwater underwater reflection photograph of a clear water rainforest stream biotope featuring an underwater garden filled with rare aquatic plants, Amazonas, Venezuela. 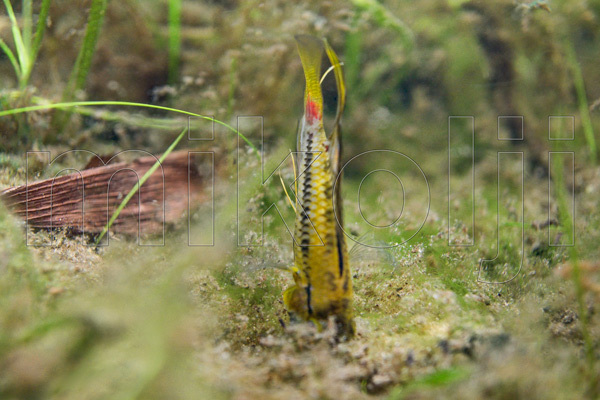 A. hongsloi as many other Apistogramma cannot be found in seasonal streams that dry out in the dry season. The seasonal streams are filled with larger migratory or pelagic fish, such as Peacock Bass and large tetras which are forced into the Orinoco River or other larger rivers as their water dries up. In A. hongsloi micro habitats it is not uncommon to find little volcano like formations in the river bed. Upon closer inspection you will notice that the sand seems to be boiling out of the ground. This is underground water which reaches the surface. If you place your hand over the spouts, you’ll feel the water much warmer than the stream water. 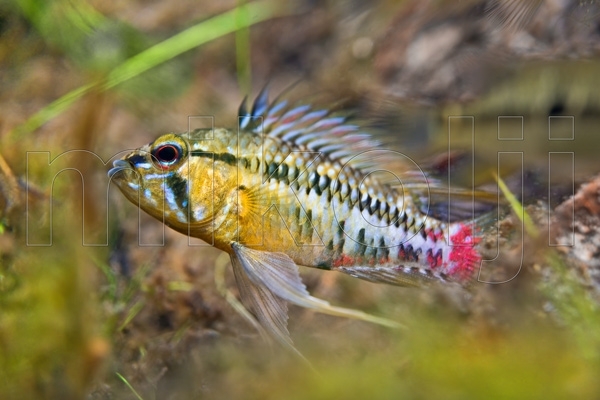 A. hongsloi as many other Apistogramma cannot be found in seasonal streams that dry out in the dry season. The seasonal streams are filled with larger migratory or pelagic fish, such as Peacock Bass and large tetras which are forced into the Orinoco River or other larger rivers as their water dries up. In A. hongsloi micro habitats it is not uncommon to find little volcano like formations in the river bed. Upon closer inspection you will notice that the sand seems to be boiling out of the ground. This is underground water which reaches the surface. If you place your hand over the spouts, you’ll feel the water much warmer than the stream water. 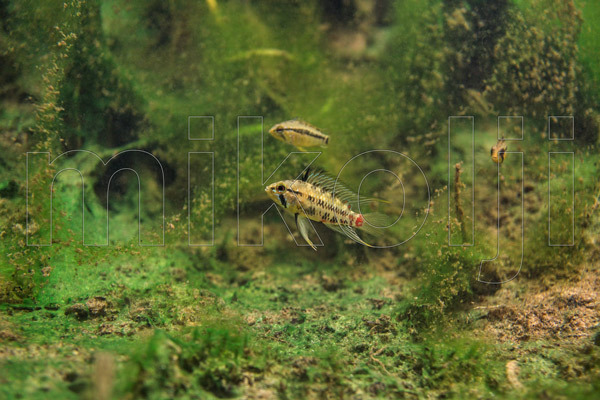 This is a freshwater underwater photograph of Dwarf Cichlids, Apistogramma hongsloi, in their natural habitat, Amazonas, Venezuela. In the dry season, A. hongsloi as many other fish in its genus, enter a very dull coloration stage. They become dark, yellowish brown. Their color seems dulled proportionately compared to how much they are aestivating which seems to depend on the degree of “dryness” their habitat is going through. Aestivation is like a “tropical” hibernation where the cold and snow is replaced by heat and dryness. In the dry season, they do not move much and do not seem to be interested in anything but conserving energy. You barely see them do anything but stay still between or under the leaf litter and rotting aquatic plants. They do not go out in the open. In the rainy season, A. hongsloi come to life. Their colors brighten as the breeding season gets closer. They are feeding constantly. Younger males challenge older males in the open fields of green Eleocharis while the females graze around them. They flash and beat their tails at each other, swaying from side to side. It is a magnificent show to watch live in situ! Nature at its best! The red coloration on their caudal peduncle that was dull in the dry season brightens up, screaming “I’m here girls.” The females also brighten up their coloration a bit and turn white or light yellow. The once dispirited slow running water becomes a lively flow of life. Each male seem to have at least three females, one of them being their favourite. Once in the breeding season one male can breed with only one of the females or sometimes more. He “visits” each of his partners which stay a couple of feet away from each other. He seems to go around checking if his kids are being taken care of correctly and then leaves to see his “other” family. One thing is for sure, each male A. hongsloi has a favorite girl or family which he spends more time with. The female takes care of the fry, always swimming over them in a protective way. The babies are extremely well camouflaged and can barely be seen as they move slowly over the river bed. To spot a female with fry I actually have to look at her distinctive parental behavior and then look under her closely to be able to spot the fry. If she swam a foot away, I would not be able to spot the little ones. At the end of a long rainy season the fry are 2 to 3cm long and will continue to grow until the season cycle starts again. In the wild, A. hongsloi can live many years. I have spotted some super large specimens that have a shabby, bully, threatening look. The young ones do not mess with them! 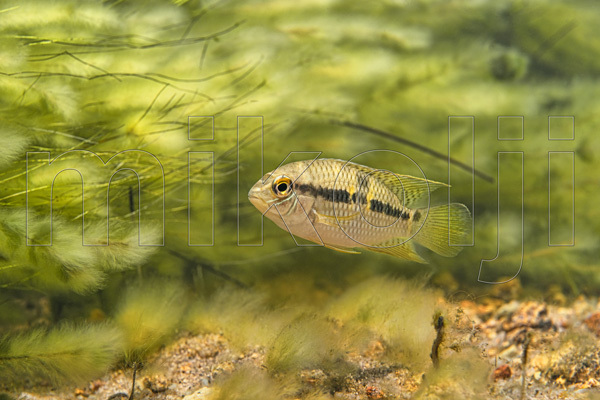 This is a freshwater underwater photograph of a Dwarf Cichlid, Apistogramma hongsloi, in its natural habitat, Amazonas, Venezuela. A. hongsloi share their habitat with many species of fish most of which happen to be of a very small size. It seems that A. hongsloi picks sections of the river where larger fish or predators do not live. This is a trait that is quite unique to A. hongsloi because I have found most other Apistogramma living among or in sections of the river that have many species of larger fish in them. Is this a coincidence? Probably not, it’s a trait followed by them in many different geographical locations. The most common resident are small Aequidens metae, Nannostomus anduzei, Copella sp, and freshwater shrimps. 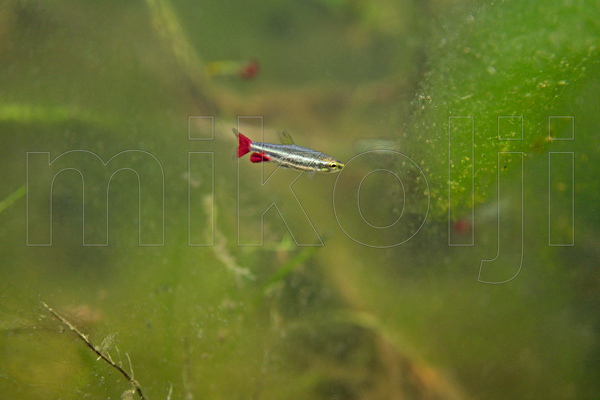 This is a freshwater underwater photograph of an Anduzi’s Pencilfish, Nannostomus anduzei, in its natural habitat, Amazonas, Venezuela. 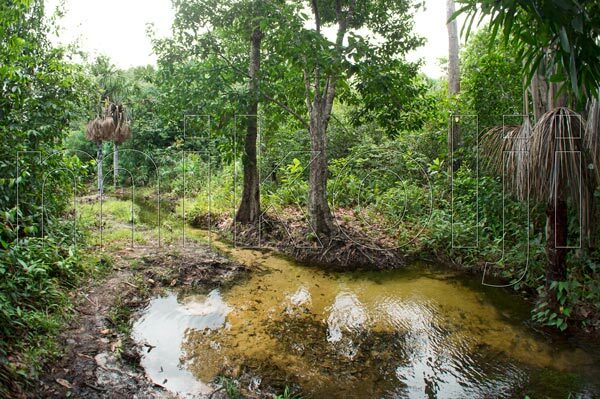 A large amount of our tropical fish habitats are being lost because the local people or newcomers who chop down the riparian vegetation to make space for growing crops, for cooking combustion material, or building materials. The smaller the stream, like those of A. hongsloi, the higher the loss risk is. It is important to take the time and teach the locals about the benefits they get from a sustainable permanent, clean water source and how all the flora and fauna depend upon each other. The loss of habitats and all the animals and plants in them is a direct loss for the aquarium hobby. 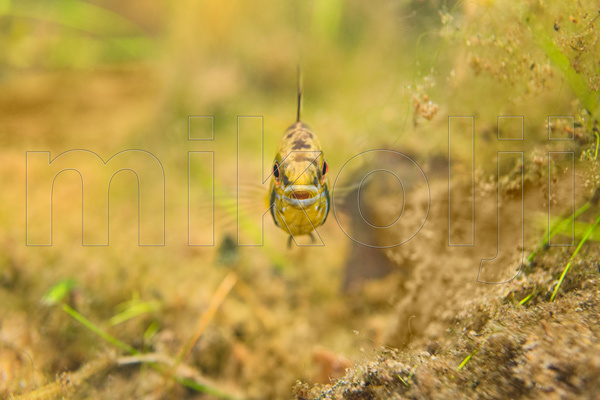 This is a freshwater underwater photograph of a wild Yellow Acara Cichlid, Aequidens metae, in its natural habitat, Amazonas, Venezuela. We are spending most of our efforts going to remote places, where no other human has ever been, to capture the newest, strangest, never seen fish. Little effort is placed where the real ecological threats exist which are in those populated, not so remote and well known places. There has to be a balance, a little of fish collecting and a little of education, a give and take to preserve our vocation. It would be so sad for you to read this article and know that the next time I visited the streams, they are dry and as dead as can be. To me, the real future of the aquarium hobby is thinking beyond the aquarium and placing my little grain of sand in saving our ecosystems. 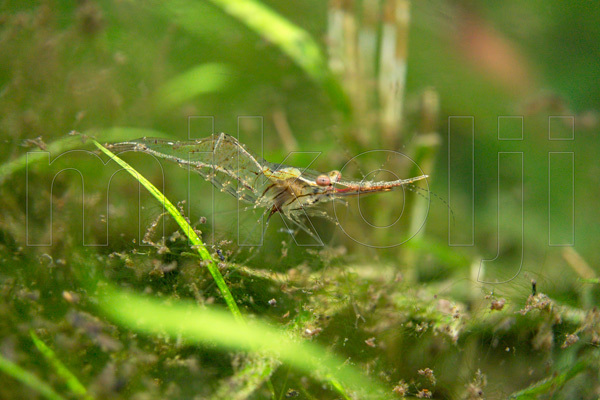 This is a freshwater underwater photograph of a freshwater river shrimp, in its natural habitat, Amazonas, Venezuela. I ask them, “Isn’t this fish super beautiful?” Nodding my head and smiling; they smile back and nod their heads, too. Very nice and interesting article. You can say what plants are in those pictures? Awsome read! Thanks for writing this page.